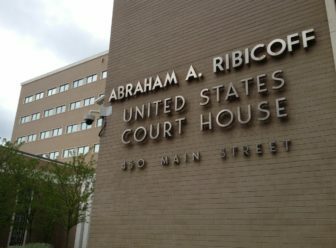 Washington – President Donald Trump has already appointed one judge to the federal bench in Connecticut and will soon appoint another, adding to a record clip of judicial nominations by his administration. While Connecticut’s federal bench may not be a flashpoint, at least not yet, in the bitter partisan war over judicial appointments, the state is likely to feel the fallout from the struggle. As of Thursday, a little more than two years into the Trump presidency, the U.S Senate has confirmed 37 judges for U.S. Courts of Appeals. In contrast, President Barack Obama got 55 appellate court judges confirmed during his entire eight-year term. The Trump administration also won confirmation of two U.S. Supreme Court Justices and of 93 judges in federal district court — including Kari Dooley, who sits on the U.S. District Court for the District of Connecticut. Dooley’s nomination was not controversial. She was on a list of recommendations submitted by Connecticut’s Democratic Sens. Richard Blumenthal and Chris Murphy. There’s another vacancy on Connecticut’s federal bench, created by last year’s retirement of Judge Alvin Thompson. Blumenthal said that he and Murphy hope to soon submit recommendations for that vacancy, too, and expect the Trump administration to take the senators’ advice. But in a number of courts in other states, including an appeals court in New York that hears cases from Connecticut, bitter fights have erupted over Trump’s choices for the federal bench. For instance, Sen. Dianne Feinstein, D-Calif., on Thursday decried the vote in the Senate Judiciary Committee for two nominees for California’s 9th Circuit Court of Appeals, Ken Lee and Dan Collins. Neither nominee had received a” blue slip,” in which the state’s senators submit a favorable or unfavorable opinion of a nominee. Without at least one favorable blue slip, nominees traditionally do not move forward. The conflict over federal judges escalated this week after Senate Majority Leader Mitch McConnell, R-Ky., implemented a rules change that would allow quicker confirmation of judicial nominees. On a party line vote, the Senate voted Wednesday to cut debate for Trump’s judicial and executive branch picks from 30 hours to two hours, the latest in a series of changes to the fabric of the Senate to dilute the power of its Democratic minority. Besides filling the current sole vacancy on Connecticut’s district court, which operates out of courthouses in Hartford, New Haven and Bridgeport, Trump is also likely to name other judges to that bench as some of its older jurists retire. The majority of judges currently on the federal bench in Connecticut were nominated by Democratic presidents, mainly Obama and former President Bill Clinton. Trump’s appointments will increase the court’s GOP-nominated judges. The U.S. District Court for the District of Connecticut is one of the original 13 courts established by the Judiciary Act of 1789. That court has 8 active judges, 6 senior – or semi-retired — judges and 5 magistrate judges. Trump is likely to leave a greater imprint on the New York-based U.S. Court of Appeals for the Second Circuit, which hears appeals from Connecticut. Congress has already confirmed one of Trumps’ picks for the court, Judge Richard Sullivan, and the president has two other nominees pending for that bench, Joseph Bianco and Michael Parks. Both nominees have drawn fire from liberal groups and are opposed by the New York’s Democratic senators. The Trump administration and McConnell have made judicial appointments a priority, especially now that Democrats control the House and the president’s agenda will have a tough time getting through Congress. Because of the lifetime appointments of judges, the effort could dramatically move the direction of the courts to the right for generations, a legacy that would long outlast the Trump presidency. But in the near-term, federal courts have been key players in blocking Trump policies. Federal judges have temporarily stopped the Trump administration from ending the Deferred Action for Childhood Arrivals (DACA) program, maintaining protections for ‘Dreamers,’ asTrump attempts to restrict asylum applications. Courts have also invalidated the Trump administration’s attempt to add a question about citizenship to the 2020 Census and several efforts to roll back Obama-era environmental protections. Trump has blamed his losses on “Obama judges” in the West Coast states that make up the 9th Circuit. While 29 Trump setbacks have come from 9th Circuit judges, the trend is national, with 34 originating elsewhere, particularly in the District of Columbia Circuit, according to a count by The Washington Post. Connecticut is involved, and sometimes the lead player, in 20 cases against Trump administration policies filed in federal courts. Courts have also given Trump some victories, including one on his ban of Muslims from certain countries, and could help fulfill one of his biggest initiatives, the elimination of the Affordable Care Act, whose constitutionality is under review by the New Orleans-based 5th District Court of Appeals.